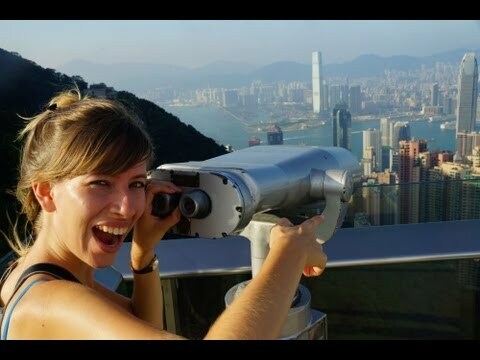 For the best views of Hong Kong Island we took a tram ride up to the Peak. As a tip for visitors, considering going in the late afternoon before the tourist hoards visit for nighttime views. It’s spectacular at night; however, it can be so crowded that you’ll feel as though you’re in a sardine can. Peak Tram Ride along with stunning views of Hong Kong Island and Victoria Harbor from The Peak (太平山). We are visiting Victoria Peak. One thing I find fascinating about Hong Kong is that they use bamboo scaffolding to make buildings. Unbelievable and it works. So we’re on the tram now and we’re traveling all the way up to Victoria Peak and it’s really steep. Well, well what do you think? We’re so high up it’s scary. I’m not going near the edge. So we took the tram all the way up and it was a bit of a scary ride because it is super steep and you’re kind of leaning back in your seat kind of holding on to the rail in front of you. But we survived and the views are pretty impressive. Like once we got up here we had to go through a mall like just several levels and now we’re up here on top and it’s a beautiful sunny day. It’s nice. How many time have you been here? This is my second time here. My first time here was 2008. My very first time I went backpacking, so that’s a long time ago. Has it changed a lot? Well, there is some new buildings obviously yeah. So the skyline has changed a little bit but when I came before it was late at night and this place was packed. It’s nice to come around this of day between say four and six o’clock because there is hardly anyone here. We can find little quiet areas to just rest in the shade. It’s great. Hong Kong without a doubt has the most impressive skyline I’ve ever seen. Just phenomenal.